This very handsome, definitely cute, Asteraceae is a favorite with many wildflower enthusiasts. Few plants have such bright, large, and numerous flowers in relation to their height and width. Easter Daisy is quite common and once one gets to know its habitat of open sandy soils, it is easy to find. 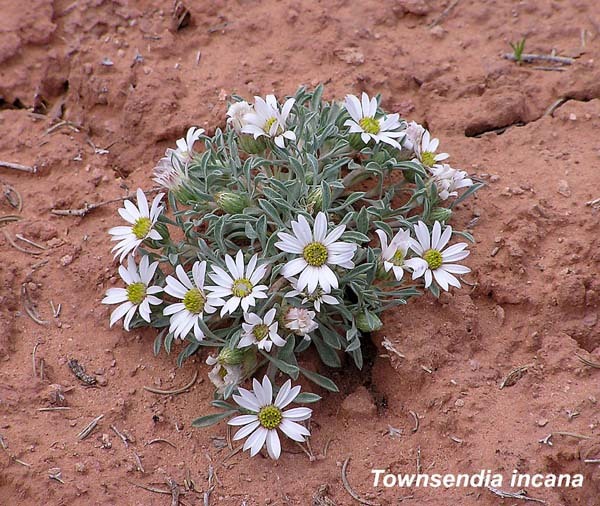 Of the seven species of Townsendia in the Four Corners area, T. incana is the most common. There are at least 25 species of Townsendia, all in Western North America, and determining the exact species of Townsendia one is looking at, is, as Intermountain Flora puts it, "notoriously difficult". Thomas Nuttall collected the first specimen of Townsendia incana "On the Black Hills" on his trip with the Wyeth Expedition of 1834-1837. (Nuttall's words as quoted in Intermountain Flora.) The first member of the Townsendia genus was collected a decade earlier in Saskatchewan by John Richardson (for whom Geranium richardsonii was named).